View More In Tool Organizers - Page 3. Are you ready to engage in a dirty or messy job? Worried about washing stubborn dirt off your clothes? Why not to choose our BOJECHER Oxford Tool Apron? Not only will this handy garden tool apron keep you away from the dirt,mud, hot spills, liquid splashes, dust or paints, but also the front pockets will keep your tools organized without messy fallout to keep your tools right where you need them. Small pocket is designed for cellphone, even if you are working in the garden or busying in other heavy works you will not miss any one call or SMS. 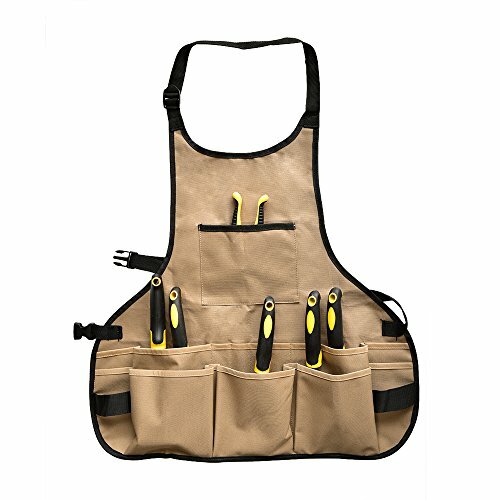 1.BOJECHER Garden Tool Apron combines craft and ergonomic design to meet your most demanding needs, multi-pocket design can hold your phone, screws, pliers, scissors, hammers, flashlights and brushes, etc. 2.BOJECHER Tool Apron is made of 600D Thickening Waterproof Wear-resistant Oxford cloth, making it difficult to be scratched by some sharp or heavy tools, and the edges are reinforced to prevent any abrasion and rupture, the pockets are deep, so you do not worry tools will fall out. 3. Each strap of the apron is 28 inches (70cm), the height and tightness of the apron can be adjusted by tightening and loosening the straps, even when the pockets are full, it is your shoulders affording weight rather than your neck to prevent neck pain. - Do not wash it by machine. - Do not clean with detergents/solvents/bleach. - Clean with warm water. - For Stubborn stains, gently brush it with a soft brush. - Air dry hanging in warm room. SAFETY WEAR-RESISTANT MATERIAL -- Made of high quality, thickened durable 600D Oxford cloth, without any pungent smell, comfortable and breathable. The reinforced edges and pockets can prevent any abrasion and scratches, you can put any small tools in the multifunctional garden apron as you want. ENOUGH SPACE TO ORGANIZE YOUR TOOLS -- With 14 handy and easy-to-reach pockets of various sizes( 1x top pocket, 5x large pockets, 4x medium pockets and 4x small pockets ), the garden tool apron is big enough to organize your hammers, screws, pencils, knives and other tools, just enjoy your gardening time! ADJUSTABLE WAIST STRAPS DESIGN -- The long waist strap measuring 28 inches (70cm), with double stitching craft of the neck and waist straps, the garden apron can support additional weight. The straps & buckle design allow for a range of adjustments. BUY WITH CONFIDENCE -- We offer 30-day money-back guarantee for any reason, 18-month warranty for quality-related issues. If you find any problem with our garden tool aprons, please fell free to contact us, we will response within 12 hours. If you have any questions about this product by BOJECHER, contact us by completing and submitting the form below. If you are looking for a specif part number, please include it with your message.